יא עַתָּה יָדַעְתִּי, כִּי-גָדוֹל ה’ מִכָּל-הָאֱלֹהִים: כִּי בַדָּבָר, אֲשֶׁר זָדוּ עֲלֵיהֶם. Wisdom of Solomon 18:8, above, completes the ellipsis in the biblical verse. 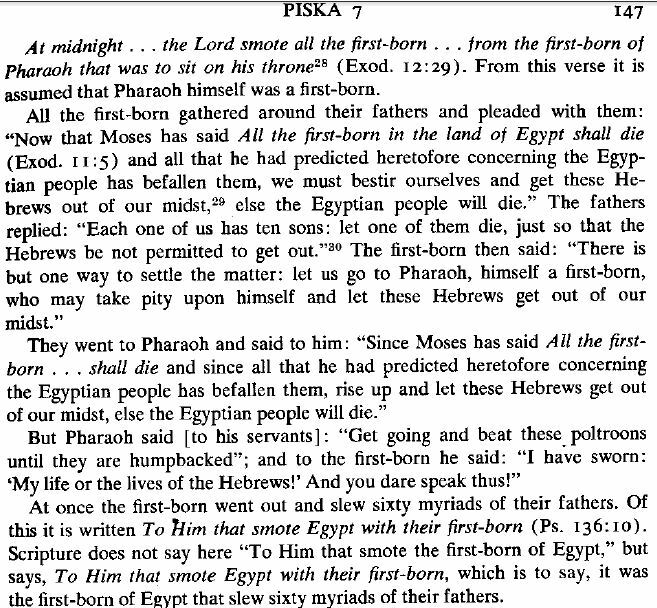 Rabbinic exegesis of this verse (though not necessarily applied to plague of firstborn) , e.g., in Sotah 11a (cited by Rashi on the verse): בקדרה אשר בישלו, בה נתבשלו. “Jub. 48: (1) v. 14: “All of the people whom he brought out to pursue the Israelites, the Lord our God threw into the sea—to the depths of the abyss—in place of the Israelites, just as the Egyptians had thrown their sons into the river. He took revenge on 1,000,000 of them, 1000 men (who were) strong and also very brave perished for one infant of your people whom they had thrown into the river.” This verse explains the drowning of the Egyptians as an instance of “measure for measure” (cf. Jub. 4:31), a motif that recurs in other compositions that address the story of the splitting of the sea (Wisd. Sol. 18:5; Mek.